Jenifer is very organized and prepared! From the first visit through the entire planning process, she was always quick to reply and even helped me brainstorm some ideas for the reception. I also appreciate how Jenifer took the time to ask me if I had any concerns a week prior to the wedding and took it upon herself to ask the vendors questions and get it all sorted out so I wouldn't be stressed. We had such a blast on the day of, and everything went so smoothly! Definitely appreciate her being such an important part of our big day. Lily & Huy!!! Your wedding at Marbella Country Club was so smooth and perfect...Julie and I were thrilled to be a part of your day! I am still in awe of how perfectly that red dress fit you!! Congratulations to you and Huy and we cannot wait to see all of the photos and video!! Thank you Jenifer for your calm and wonderful demeanor and flawless execution of our wedding! From our first email and meeting with Jenifer, we knew she would be a great fit for our wedding. We had felt a sense of ease when we spoke with her and felt that our personalities clicked. Throughout the entire year of planning, she provided great vendors and ideas! We also need someone who would execute the day exactly how we envisioned and handle the logistics and details that we definitely would have missed without her! Jenifer met us at our initial floral meeting, venue walk-through and tasting, and final mock-up floral meeting. We were immediately relieved she was there. She asked the venue/florist a ton of great questions I would have never thought of and helped us figure out the best timeline for the day. She was patient, thoughtful, and creative. Throughout the months leading up to the wedding, she answered all of our questions, jumped on the phone when we needed assurance of things and coordinated everything with our vendors. 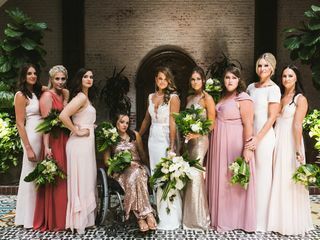 She worked secretly behind the scenes with her team to ensure the wedding day went smoothly. The day of the wedding was PERFECT! She came with a big smile on her face and the same calm demeanor that I desperately needed! She handled everything for us so all we didn't have to think about one thing! Again, we are so grateful! When we came back to our hotel room at the end of the night, everything was packed up and she even brought us the top tier of our wedding cake! We didn't need to worry about a thing! Highly recommend booking Jenifer for all of your wedding needs. Many, many thanks! Amazing experience working with Jenifer! Jenifer was an absolute life-saver on the day of our wedding, and she was such a joy to work with. Super laid-back and honest, Jenifer came up all the way to LA to meet with my husband and I to get a scope of what we were looking for the day of our wedding, and quickly took over all the organization and coordination needed to give us the perfect day. 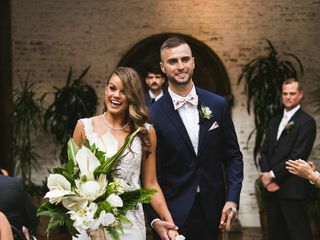 We had a bit of a non-traditional, laid-back wedding (complete with catered burgers and Rock Band) and she quickly adapted to our vision and gave recommendations in line with what we were looking for. She frequently went above and beyond what was needed, including picking up various rentals on her way to the venue for us and lending us some last-minute items we completely forgot to purchase. (Whoops!) On the night of, she kept us completely stress free with drinks in our hands, making sure we got fed and the cake got cut. I'd recommend her in a heartbeat to anyone else. Your wedding at Block Party is going down as one of my favorite non-traditional weddings ever! I had no idea we could actually get that many people to play RockBand all night!! You guys were truly the easiest going people to work with and I had a blast working with you both! Thank you Klink for being a part of our wedding day team! It was a pleasure to work with Jennifer Eddy (behind the scenes vendor coordination/timeline building) and Allene Marshall (on-site rehearsal lead and day of coordinator). Having someone else on-site directing all the moving parts helped to put me at ease on the wedding day. They use Aisle Planner as the software to keep track of all vendor contracts, to-do lists, and timelines. Our wedding venue had quite the challenging 45 minute setup period and Allene and her assistant got everything in it's place for setup as well as break down at the end of the night. Allene even did her best to get wrangle our DJ who had gone rogue with the timeline. Jaimie! Thank you so much for taking the time to write this review of our services!! 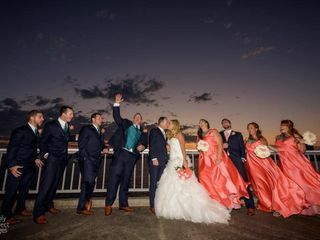 It was so great to work with you and Allene and Terra are still talking about how much fun it was to do a wedding at the Aquarium of the Pacific! I really missed out that night! They also said that you and your family were amazing people to work with! We were so thrilled to be a part of your journey to husband and wife! Best wishes! If I could give more stars for value I would! Jen was the best addition to my wedding experience that I didn’t know I needed. She effortlessly coordinated the rehearsal and went over every last detail that was necessary with me. Then spent the rest of her time on every last detail that I didn’t need to be involved in just to make sure it was perfect, flawless, and Doug and I could just enjoy the day! She has the most calming personality, is very knowledgeable, and organized. I can’t say enough good things except contact her and book immediately. Jenifer really loves what she does, and it definitely shows in her work. She is very detail oriented and it helps the planning process go super smoothly. She provides all the tools for the couple to provide her what is needed so that she can execute the perfect day for you. She gives plenty of recommendations should you need any. And day of you literally do not need to worry about anything. She has it all covered. She also makes sure you are fed and not thirsty. Talk about taking care of her client. I would 100% recommend her for your wedding day coordination/planning. Food and drink are important on your wedding day lol!! I was so excited to get to come alongside you both and help you have a wonderful wedding at Brick in San Diego! Although I am super jealous of that rad honeymoon you went on! love you! When I think back to our wedding day, May 26, 2018, I could not be more happy with the way it turned out. I met Jenifer for the first time (in-person) at our design meeting. Jenifer's first impression was an accurate interpretation of the quality of service she would soon provide for us on our special day. She was calm, personable, organized, and detail-orientated. What else could you ask for in a wedding coordinator?! Our wedding day was made complete by her ability to bring all that we had envisioned to fruition. She executed every last detail to the extent, or better, that I could have hoped for, while also allowing my husband and I to enjoy the night to its completeness. 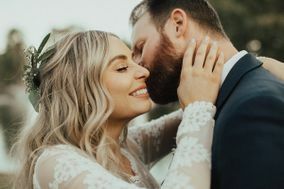 Jenifer's love for her clients and what she does was evident in her prompt expert advice and delivery of an easy-flowing wedding day. I recommend Jenifer and Klink Events without hesitation and still feel so blessed to have had such an amazing coordinator!! Coordinating your wedding at The Ebell in Long Beach was easy and so much fun! Your organization and attention to detail made my job a piece of cake! I still have goosebumps from the speeches both of your dad's made. You and Scott are clearly amazing individuals and it's was a beautiful thing to get to celebrate your love with you and your family and friends! Thank you for everything, Jenifer and team! You were instrumental in the planning process and I was blown away by the thoroughness in the day-of setup and coordination. Best investment I made! Cutest couple award to you guys!! I hope the reception in Taiwan was fun and the honeymoon is better!! Best wishes to you for many happy years of wedded bliss! I used Klink Events as my Day of Coordinator and I could not be anymore pleased! Jenifer and Team surpassed all expectations and spared no detail for my special day! Belen & Juan - You guys were just the easiest to work with! You both have such geniune spirits. Best of luck to you in your new adventure as husband an wife! Thanks for letting us be a part of your day! Jenifer was simply amazing. She's very professional and she knows what she's doing. She's friendly and very accommodating. She made our wedding day stress free. I would highly recommend her. Your sweet words are a gift! You guys pulled off such a beautiful wedding at Franciscan Gardens! You were both a joy to work with! Marriage looks good on you! Jenifer is absolutely divine and she was the best vendor I worked with on my wedding day! Jenifer is everything you want in a day-of coordinator. The week leading up to the wedding and the day-of was one of the craziest week of my life and Jenifer was like my fairy godmother. She was so sweet and accommodating to whatever came her way. 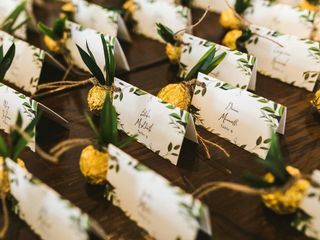 She coordinates with each of your vendor to make sure everything is done to how you want it, and she has a very detailed timeline on the day-of to make sure your wedding day runs on schedule and as planned. Jenifer constantly checked-in on me and I am so appreciative of all her hard work. Do yourself a HUGE favor and hire Jenifer. She is AMAZING and worth it! Awe Josephine, you my dear were a such a gift to me! I was blown away with your calm demeanor as you handled so many obstacles the weeks leading up to your day. Marbella Country Club was the perfect venue for you, Brandon and your families! Thank you so much for your kind words! Can't wait to see all the photos! If you are a DIY bride but need someone to help keep you organized and on track, Jenifer is your girl. My wedding was perfect and I would have had a million breakdowns if it wasnt for her. She managed all my vendors, made sure everyone knew where they had to be and when, and setup my venue even better than I would have done. I would get married again just to use her services because she was that good. Irene & Andrew!! Truly the mellowest couple yet! Your easy-going attitude made my job easy! You did such a great job with your DIY wedding...I bet no one had any idea how much you did yourself! I loved that you kept the ceremony and reception outside at The Brea Community Center! Dinner and dancing under the stars made for the perfect vibe! Congratulations and thank you for allowing Klink to bring your day together for you! Jenifer and Patsy are wedding angels! Jenifer assisted me in organizing every detail with Aisle Planner a planning website she provides. She handled things & answered questions that weren't within her job description as she wants to make your fairytale a reality. She calmed my nerves and kept all my vendors in line. She led my rehearsal without our officiant and managed to wrangle everyone in and make sure we all knew exactly what to do. On the big day Jenifer and Patsy were amazing. Jenifer timed things PERFECTLY with setup and everything was exactly as I had envisioned. A gust of wind blew just prior to the guests arriving blowing over our arch and crushing our flowers. Patsy somehow zip tied all the roses back together and made it look like nothing ever happened! I did my own floral centerpieces which started to fall apart. We cut down extra roses and Jenifer swapped out the bad roses during setup, something she absolutely didn't have to do! She kept or timeline on track and a drink in our hands all night. She made sure EVERY detail we wanted to happen occurred and she did it all with a smile on her face. Several of our guests said how amazing Jenifer was including my dad who was against hiring a DOC. I teared up when thanking Jenifer because I was so thankful. Even if I had been able to coordinate things on my own I wouldn't have been able to enjoy my day. The #1 best decision I made was hiring Klink! Thank you so much Jenifer & Patsy!! Jennifer was an amazing coordinator! She and her assistant was a breath of fresh air. The day of the event everything went perfectly. Jenifer was a pleasure to work with and I'm so glad to have stumbled upon her website by chance! 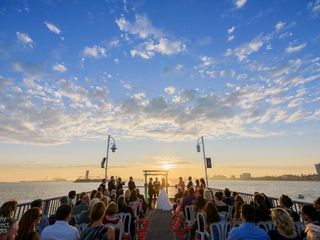 I was planning a wedding in OC from afar and was very particular about what I wanted in a day-of coordinator. The most important thing was finding someone who is down to earth and personable, and Jenifer was just that! Girls, when you know.. You know! Amirite?! The month leading up to the wedding was seamless! She was accessible through emails and was even able to accommodate our last minute trip to CA for a venue walk through. Throughout the planning process, we used Aisle Planner and with the information my groom and I provided she was able to create the timeline, contact and manage our vendors, and execute the wedding day perfectly. We have received many compliments on the execution of our wedding day from family and friends and it really is all thanks to her and her hard work. Once the wedding day was over, her assistant Patsy was able to help transport my bouquet, gifts and wedding decor back to our hotel suite. When we arrived our suite was decorated with flowers, champagne and tacosss! This package (The After Party) was great and would love to recommend it to you if you were on the fence about it. In addition, we had accidentally left a few things behind at the venue and she was kind enough to bring them home with her. Since we lived out of town, Jenifer offered to mail those belongings back to New Jersey! Small gesture but it truly speaks volumes to just how great she is! We are so grateful to have had her be a part of our wedding day and would love to recommend Klink Events for your upcoming wedding also! I am beyond grateful for the help of Klink Events!! I couldn't have done it without them. Every question, concern, worry, fear and uncertainty was put at ease by Jenifer. She is incredibly efficient, organized and professional... all the while will become your best friend. She is easy to talk to and completely honest and transparent about everything you need to know. You will also not know any of the hiccups on your day of, which I found so comforting. I would use her again, but I won't need her:-)) so I'll just have to keep telling every bride how much easier she made my day and will make yours:-))) Thank you Klink Events!! Yayyyy!!! You and Matt made my job so easy. Simple, casual and so much love! That was the perfect recipe for the perfect wedding day for you guys! I am beyond happy for both of you and so thankful you are a forever friend!! Jen was a godsend to my husband and I! I had found Klink Events on craiglist when Jen was just starting out in the business. I was super nervous as any couple would be finding wedding services on craiglist but we took a chance. Right off the bat she made us feel comfortable and reassured us that she knew what she was doing just by her demeanor and the way she worked and communicated. We booked her a few days after our meeting and it was one of the best decisions we made planning our big day. Jen was always available for questions through text, emaiOld and phone calls. The tools she had for us to use as a guideline while planning our own wedding was awesome. It helped keep us on track so much! The Month leading up to the big day was chaotic but Jen was a rockstar and was by our side the whole way. Emails after emails. I don't know what we would've done without her. She gathered all of our planning and made sure all of the vendors were all on the same page. Everything was smooth sailing on the wedding day. I had not a worry in the world, I knew Jen had everything under control. She executed everything we envision clearly and perfectly. Jen and her assistant Patsy were awesome and I got to enjoy myself as a bride, which is a huge thing cause not a lot of brides do! Hiring a day of coordinator is a must! We loved Jen so much and can not have done all this without her. If you are looking for a coordinator, look no further. Jen is your girl! Book Klink Events!!! I miss you crazy couple already! Your honeymoon photos were like a dream! I was so honored that you picked me, and I appreciate you taking a chance with me! Your review gave me goosebumps! I am truly humbled and grateful! Jenifer was on it and made me feel calm throughout the ENTIRE process! The day-of went so smoothly and she was such an awesome person to work with. You and your family were such a joy to work with!! They are too much fun! They day was perfect and you looked stunning!!! A&M - You guys are just the greatest! I wanted you to believe in me when I told you I had it covered. I know it isn't always easy to give up control of all that planning, but I am so thankful you trusted Patsy and I with your vision! You did an amazing job planning your day and I can't wait to see what your cute little babies look like!! MUWAH! Jenifer is AMAZING. I am so beyond pleased with the professionalism, responsiveness and support that Klink Events provides to their brides. Our wedding day was was nearly effortless thanks to Jenifer and her team- AND she helped me keep my sanity. If you're looking/thinking about hiring a wedding coordinator, Jenifer is your gal! She's affordable and fantastic. Thank you for everything!!! A+E - You were much more calm than you give yourself credit for my beautiful friend. Your family was amazing and the day was absolutely perfect! I mean really??!! A Christmas themed wedding??? Yes please! And you and your mom knocked it out of the park! I was so honored to be a part of your special day! Jenifer at Klink Events is AMAZING!! She takes out all the stress a wedding can create. I can honestly say without her I don't know what I would have done. She takes you step by step through all the planning and understands how stressful your big day can be. She is genuine and down to earth and there for you throughout the whole process. She is very quick at responding to emails and text messages. I would definitely recommend her to everyone I know getting married. In fact I have two sisters getting married and I will be referring Jenifer(Klink events) to them. If you are on the fence about a wedding planner definitely spend the little extra on Klink Events they are there from the beginning to the end. Jenifer even stayed late to tear down everything so we wouldn't have to worry about it. Truly a great experience. THANK YOU SO MUCH JENIFER AND KLINK EVENTS!! Jen was such a blessing and I can say, post wedding, that my big day wouldn't have been as perfect as it was without her! If you're looking for a day of coordinator that you can count on, stop looking because she is THE ONE! She made my big day completely stress free down to the tiniest detail. It was amazing having her by my side that day because not only did she make everything seamless for the vendors (and you) but she was just fun to be around!! She has this way of making your big crisis an easy fix! She goes above and beyond for you throughout your whole planning process and eliminates any fears that you may have going into your big day and she sticks with you to the very end! Klink Events was amazing! The best word to describe Jenifer and Klink Events: Execution. She executed every detail of our wedding perfectly. From picking up the cake, coordinating the rehearsal, managing the guest, working with the vendors on timelines, setting up the reception room, and most importantly always making sure we were happy and stress free. The bride had one unrealistic desire on the wedding day and that was to enjoy the cocktail hour appetizer tray pass. Given the time restraints, as expected, we were stuck in picture mode and were not going to be able to make it in time. Jenifer recognized this and ordered the waiters/waitresses down to where we were taking pictures to make sure the bride and I enjoyed the tasty food and champagne. Amongst the million other things she had to do in that moment, she always remembered my wife’s desire and made it happen. Perfect! Second, third, fourth…best word to describe Jenifer and Klink Events: Caring, loving, attentive, assertive and professional. When hiring Jenifer, you are not going to get someone that is simply going to do their job and check the boxes. You’re getting someone that is going to exceed all expectations you have because she loves what she does and she loves creating a special day for you. I know there were stressful time restraint moments during that day and every time my wife and I spoke with her she stayed calm and in control. My wife and I both work in the corporate space and recognized right away that Jenifer is a leader. She knows what she is doing and will work with your vision to create the perfect wedding day for you. She truly is the CEO of your day. Klink Events is by far the best decision we made for our wedding. That may sound cliché to say but after the fact, you realize how much work, time, and effort she puts into making sure your wedding is perfect. We are so grateful to have had Jenifer lead the planning stages and execute brilliantly on our wedding. Hands down the best day of coordinator you will find. D+J - WOW! I think I needed an entire box of tissue to get through this review. I feel so honored to have been able to be there for this special union! Not only are you guys seriously the most beautiful couple ever, but your beauty is far deeper than the surface. You both have hearts of gold and the kindest spirits. You can tell you came from amazing homes. Congratulations and I hope married life is treating you both well! If there was a way to give Jenn 10 stars I would because she hands down deserves it. From the moment I met her I knew she would be the one. I planned my entire wedding in less than 2 months and by the time I met with her my wedding was less than 30 days out. First of all, she is a genuinely kind and sweet person. She is extremely organized, patient and helpful, and I cannot imagine how I would have gotten through my wedding day without her. Because I pretty much knew what I wanted and had done so much work on my own, I didn't think I would necessarily need a planner/coordinator, but oh my gosh, I am so glad I listened to my best friend and hired one anyway. I am even more glad that I ended up choosing Jenn. She always calmed me, responded to all of my questions quickly, asked me questions I didn't even know I needed answered, made sure I had everything I needed, took care of ALL of the necessary details, and took away ALL of my day of stress. She is so reasonably priced too, and believe me, with Jenn, you don't get what you pay for, you get SO much more than you pay for. There are so many details I didn't even think about that someone needs to deal with on your wedding day and she made sure that I didn't have to think about a single one. Everything went so smoothly and perfectly and I feel so blessed to have met her. Highly, highly, highly recommend! Jen was absolutely amazing through the whole planning process. She and Stephanie met with us the first time and made us feel completely at ease, answered all of our questions and got a clear idea of what we were looking for. Our wedding was DIY but we needed someone to help tie it all together the day of. They did so much more than "day of" coordination, she kept in touch with me throughout the whole process, made suggestions, gave me advice and reminded me of little things that I was forgetting. Come the day of: Everything was perfect. There were a few set-backs during set up and she handled them perfectly and everything came out better than we could have imagined. We didn't have to worry about anything. Picking Kink events to do our wedding was one of the BEST decisions that we made! K+D!!!!! Thank you for your kind words! I was honored to help the two of you pull off your day! You worked so hard!!!! You did an amazing job and your family and friends were my favorite part of your day! Cheers to years of love and happiness!